320p. HarperCollins/Greenwillow. Feb. 2018. Tr $16.99. ISBN 9780062686206. Gr 4–6—Boy is the village outcast. A hunchbacked orphan with a mysterious past and a knack for talking to animals, he's faced more than his share of abuse and mockery from those around him. Enter Secundus, a strange pilgrim impressed with Boy's climbing and jumping skills. Secundus pulls Boy into a journey across Europe to gather the seven relics of Saint Peter. The journey, however, is not as innocent as Boy first assumes. Instead, they're stealing relics, making enemies, and facing peril all the way to Rome. Set in the year 1350, this is a medieval tale that blends historical fiction with magical realism. 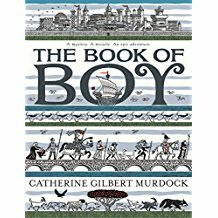 Readers will enjoy the adventures of Boy and Secundus, rife with twists that give the story more depth than a straightforward historical novel. Boy is an admirable protagonist who deals with his differences with a mix of acceptance and self-consciousness. Secundus, too, is a character that has more depth to him than meets the eye. While the peril may seem light to some, younger readers will get a thrill with every narrow escape. The book is easy to read with clear prose, short chapters, and illustrations scattered throughout. VERDICT A good recommendation for readers not quite ready for Adam Gidwitz's The Inquisitor's Tale or for those who enjoyed Karen Cushman's Catherine, Called Birdy but crave a bit more magic.